FinDEVr New York will be here in less than one week! Check out company features and take a look at the previews from upcoming presentations. And of course, don’t forget to register today to save! Hey, FinDEVr! You’re Looking Rather Smart. Barclaycard adds free Uber ride as reward for loyal cardholders. See Barclaycard next week at FinDEVr New York. OutsideIQ partners with SAP Ariba to help corporations quickly screen vendors for risk and regulatory compliance. Xero makes inroads into Asia with HSBC, DBS bank feed deals. FinDEVr alum Capital One joins the chatbot revolution with its new SMS virtual assistant, Eno. Currencycloud Collects $25 Million in New Funding. BBVA Compass unveils BBVA Momentum, a seven-month accelerator for socially-minded entrepreneurs. Kabbage nabs $500M for small business loans. Fidor partners with Van Lanschot to create the first PSD2-inspired Payment Avenue. MX to power digital money management tools for Travis CU. Advertising-monitoring firm, Mintel Comperemedia reported last week that nearly 9 out of 10 credit card solicitations in 2006 directed recipients to the Web, up sharply from 56% in 2003 (see note 1, 2). Several big mailers, namely American Express, still seem reluctant to use website response as an option, at least in the mailers we see at our house. American Express tests must show a drop in response by offering too many choices. But if you don't have the budget of American Express, which can afford to drop a mail piece in every credit-worthy household every two or three weeks, you should add website options to your direct mail creative. That way, you can at least capture a lead at your website, even if they don't ultimately accept your credit offer. 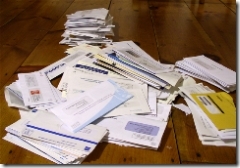 Total mailing volume for 2006 was 9.2 billion pieces (see note 1), or about 3 per week per credit-worthy household. Two of those were from the five largest mailers listed below which accounted for more than 60% of the volume, according to Comperemedia. JPMorgan Chase accounted for 18% on its own. In another data slice from Comperemedia, cited by Capital One in a Feb. 2006 investor presentation (PDF here), response rates have fallen from 1.4% in 1995 to 0.3% in 2004 (see note 3). 1. Comperemedia tracks mailing volume for more than 150 large financial institutions. So the figures here do not include mailings from thousands of smaller banks and credit unions. In total, those probably account for less than 5% of the total from the top-150. 2. Comperemedia press release is here. Interview of Comperemedia director Jenny Roock by MediaPost is here. 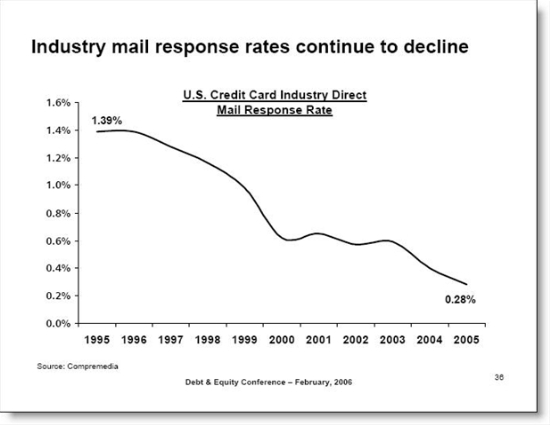 3. Credit card response rate slide from Capital One's investor presentation (PDF) at the Debt & Equity Conference, Feb. 2006; data from Comperemedia. Capital One Financial Corp. will be one of the nation’s 10 biggest banks based on deposits and managed loans when it buys Long Island’s $57.6 billion North Fork Bancorporation for $14.6 billion in cash and stock. That Capital One has turned itself into a national depository institution with branches and checking accounts is yet another indication, if one is needed, that credit cards are no longer a stand-alone business. The deal gives Capital One a toehold in the lucrative New York market, and apparent expansion prospects there. It also builds on last year’s $5.3 billion acquisition of Hibernia Bank, which closed in mid-November. According to Capital One’s 10-K, Hibernia experienced what it called substantial growth in deposits after Hurricane Katrina. Unremarked by media coverage was the irony that a business that’s still very profitable apparently feels it needs a cheap source of funds, and customers to sell to, in order to weather the many challenges now threatening its core competency. Unremarked by the media, perhaps, but not by the stock market, which didn’t respond well to the news: Capital One stock, which closed on Friday, March 10, at about $90, closed on Monday March 13, the day of the announcement, at $83.10, and at $82 the next day. Morgan Stanley’s Kenneth Posner estimated in an investment advisory that the deal was neutral to Capital One earnings, and allowed Capital One modest synergies from the deal, worth $400 million in strategic value at best. He recommended buying on Monday if shares fell. Standard & Poor’s said in a note that it felt the deal was priced fairly at about 15 times their 2006 earnings estimate for North Fork of $2.08 per share, and a price/book ratio of 1.6 times earnings. “We thought the recent weakness (in North Fork stock, prompted by concerns about its deep exposure to residential mortgages) presented investors with an attractive entry point. Apparently, Capital One arrived at the same conclusion,” wrote the note’s authors, Jason Seo and Mark Hebeka. At least Capital One was acting out of relative strength: Its 2005 net income was $18 billion, up from $15.4 billion in 2004. But the company clearly felt it was wise, at a minimum, to continue diversifying away from credit cards. Capital One’s year-end credit card balances were $19.7 billion, compared with $20.5 billion in 2004, and average loan balances fell in 2005 to $12.07 billion, compared with 2004’s $12.24 billion. Interchange revenues grew to $514 million, compared with 2004’s $475 million. On a managed basis, Capital One reported $105.5 billion in outstanding loans, compared with $79.8 billion in 2004. Hibernia’s results were not included in Capital One’s 2005 results. The company was clearly acting defensively, and recognizing that future growth in the credit card sector will be nothing like what it was only a few years ago—even for a company as well managed as Capital One—and that it won’t be again, anytime soon. By remaining on the offensive, Capital One apparently also hopes to keep Wall Street happy, and itself independent. Aside from Advanta Bank Corp., which reported 2005 net income from continuing operations of $116.7 million, America’s other monoline banks, once wildly profitable businesses, are gone with the wind. And Capital One itself isn’t entirely safe from acquisition; its float is only $25 billion, so it could clearly be bought by a large bank. Last year, Bank of America bought MBNA for about $35 billion in cash and stock, and other large banks—Wachovia Corp., for one—have said they’re interested in getting back into the credit card business. Pay Your Better Business Bureau Dues! We like the idea of posting selected third-party endorsements on your website, for example, FDIC, Better Business Bureau, VeriSign and so forth. However, make sure you don't let your membership expire, otherwise you get a very bad result. 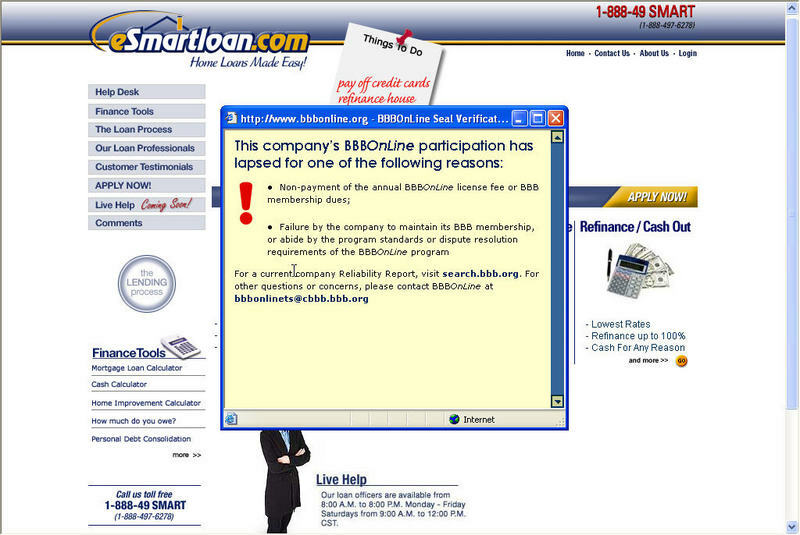 In reviewing the eSmartLoan website, purchased last month by Capital One (see Jan 20 post), we clicked on the Better Business Bureau logo on its home page and were greeted by a pop-up explaining that the company was no longer a member, either because they failed to pay their dues or failed to comply with BBB policies.